I have been on a mystery binge the last few weeks. It’s part of my transition into summer reading. I’m all about paperbacks I can take to the beach or lake; they can get sandy and wet without doing much real damage, and they can be left on a towel without fear of someone stealing them (the kindle is great for many things, but it doesn’t enjoy the elements or prove to be quite as discouraging to thieves). Also, after months of keeping up the same work routine, these months of summer, while not necessarily vacation, provide an illusion of change. The days are longer. The drinks and barbecues and camp outs with friends are more plentiful, and in general, there’s a relaxing of the spirit. My reading habits tend to follow with a certain pleasant softening. I gravitate toward reading material that engages a playfulness rather than studious or reflective part of my brain. As a bonus, because I’m working on my own mystery novel, technically, I can call books like this research. Stretching it? Yes. A little. Maybe. But I don’t care. A good mystery is a gift, and I refuse to turn my nose up at the chance to read one. Barrett’s novel is even set near the town in New Hampshire where I grew up, so reading it felt like taking a mini-holiday back to the east coast (complete with a little family drama!). 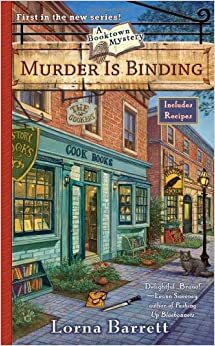 I was a little disappointed that the “binding” in question referred to book bindings and not quilting, but once I got over that, I was tickled by the idea of a town that tries to reestablish its downtrodden economy by inviting niche book shops to take over. I would happily live in such a town, and I suspect I am not alone. Honestly, the premise alone was captivating to me. I loved imagining such a place – bookstores as far as the eye could see, and for every proclivity! Barrett even included a layer of realistic tension between the shop owners and the townies. Having lived for so many years in a small town kept alive by tourism dollars, I’m familiar with its double-edged sword. It can be difficult to live someplace constantly overrun with enthusiastic strangers. They walk too slowly, they seem to speak decibels louder than necessary, and they grab all the parking…but they’re also necessary. And sometimes even adorable in that exuberant, remember what it feels like to be on a holiday sort of way. Barrett manages to capture that dichotomy here while exploring the position of an outsider like her protagonist, Tricia. Even after months of living in this town, she’s still very much on the fringes, yet when her sister comes to visit, she manages to insinuate herself with the locals in no time. It’s this push and pull at the heart of the book that drew me in, the reminder of what it felt like to live for eight years in a town where I never quite fell into step with the community, blended with the sort of dark mystery that exists in the secret heart of every town. For more about Lorna Barrett, go here. I was always into Holmes. I noted he went for the bizarre creatures as the instruments of the bad guy. The snake, a midget, a smudge of poison from the jungle. Imagine what he would write today with the internet at his disposal? I love Holmes. It would be fascinating to know what he would do with the world wide web at his disposal! Thank you for the lovely review. I hope you’ll try the rest of the series. I’m sure I will! You set the first story up perfectly to move right into the next book, and I’m looking forward to it very much.